The blowfly is a hungry and rapidly reproducing critter. So what would be the impact of a single Aussie blowfly on a rotting zombie? In theory an average 70 kg zombie (subtracting 15% body weight for the bones) would provide enough maggot meals to grow 991,666 adult blowflies. Just under a million flies. A single female blowfly lays about 300 eggs, which would become egg laying adults in just 20 days. Allowing for the gender split (eg only half the flies being females) a single female pregnant blowfly could generate a fly population of over six million flies in just three lifecycles. 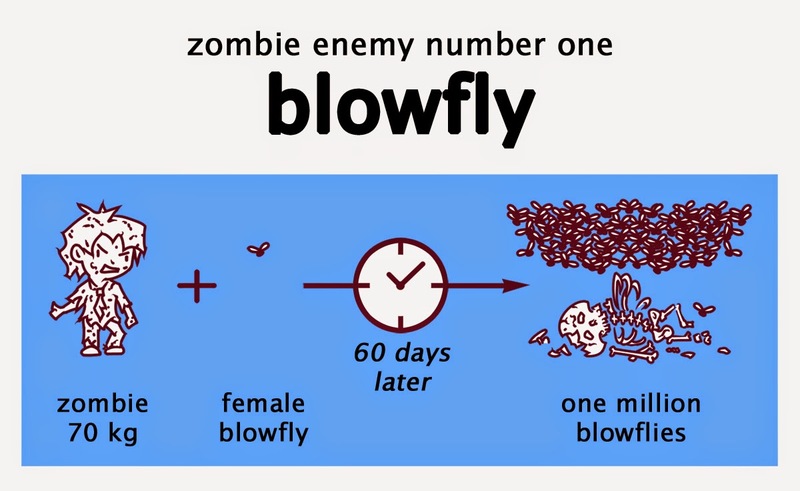 In other words a single female blowfly could destroy a zombie in about 60 days or less. In reality it is quicker, cause there will be more than just one fly laying eggs. The Australia Museum states that maggots can consume 60% of a human corpse in less than a week. Awesome. Of course it will vary depending on the fly species, climate and the death rate by fly spray. Still they are impressive little buggers. So do zombies stand a chance in the real world? Bite off more zombie than you can chew, little maggots. The Terminator set to terminate zombies?? ?